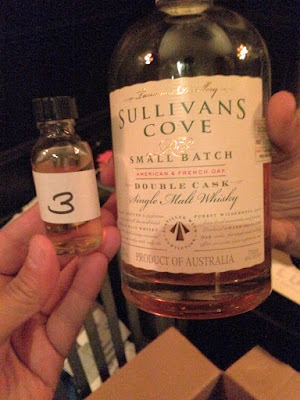 Sullivans Cove Double Cask (40.0%): Another sample from the world whiskies blind tasting led by Raj Sabharwal. It is a Sullivans Cove expression distilled by Tasmania Distillery which is situated in the city of Hobart, Tasmania. The whisky in the bottle is a vat of whiskies matured in French Oak (40%) and American Oak (60%) casks. Color: Oaked Chardonnay, yellow gold. Nose: Sweet and grainy... Golden raisins, cookie dough, vanilla extract and glazed orange peel. Noses like a young grain whisky, quite perfumy. Unsalted butter, thin honey and white chocolate drops. Palate: Chartreuse... Fresh fennel, mint leaves and cumin seeds. Toasted oak staves, unaged grape brandy and bitter greens. It tastes quite young but definitely matured and ready. Creamy and herbal... Fruit cake, butter and cinnamon. Adding water makes it spirit forward which didn't quite work for me. Finish: Medium long with dried fruits, cinnamon, milk chocolate and white pepper. Overall: It was my second favorite whisky at our blind tasting after Amrut Fusion and I still think that I was right... It is a great whisky... Fruity and spicy... Young and vibrant but easy to drink and nicely rounded. In the beginning I was a little skeptical about it is being bottled at 40.0% but I think it works quite well. No complaints there. But I wish it was coming with a tad lower price-tag but it is what it is. Definitely worth to look for... Thanks to Raj Sabharwal for the sample.